Washington, D.C. — USGBC released its LEED in Motion: Transportation report, which focuses on industry growth in the green building sector for transportation facilities such as airport terminal buildings, train stations, bus centers, seaports, light rail stations, control towers and more. The report also highlights some of the most impressive LEED-certified transportation facilities throughout the world. Transportation is one of the biggest drivers of CO2 emissions and also has the highest growth in CO2 emissions of any industry sector. Globally, in 2010, the transportation sector accounted for approximately 14 percent of all greenhouse gas emissions — fourth only to the agriculture, electricity, and industrial sectors. In the U.S., transportation accounted for 27 percent of total greenhouse gas emissions in 2015 — second only to electricity production. The International Air Transport Association expects 7.2 billion passengers to fly in the year 2035 — almost double the amount of air passengers that traveled in 2016 (around 3.5 billion). As the number of visitors to transportation facilities continues to grow, the potential human, economic and environmental benefits of building LEED-certified transportation facilities are significant. Currently, there are airport projects registered and certified in nearly all 50 U.S. states and in more than 40 countries and territories around the world — totaling more than 201.4 million square feet of space. 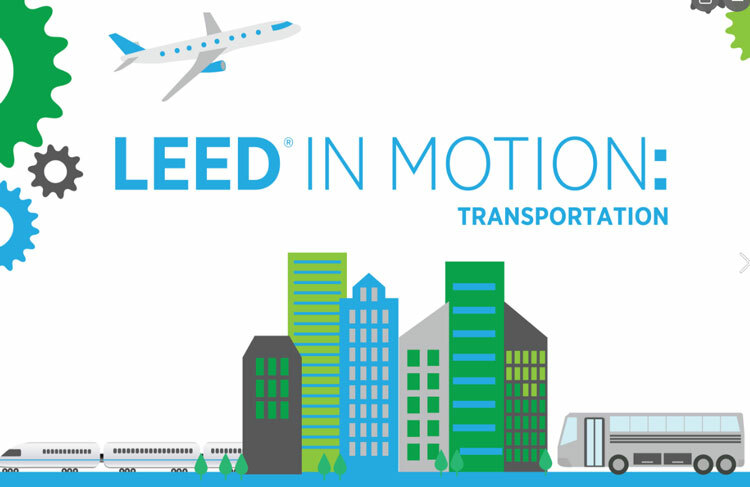 The LEED in Motion: Transportation report highlights how LEED practices and strategies are flexible, easy to implement, generate impressive results and can be integrated throughout a building’s life cycle, leading to high performance in human and environmental health. Incorporating LEED includes sustainable site development, water conservation, energy efficiency, materials selection and indoor environmental quality. In February 2017, USGBC and GBCI announced a new LEED green building rating system pilot designed to suit the unique needs of transit systems on a global scale. LEED v4 O+M: Transit will allow operational transit facilities to earn LEED certification. LEED in Motion: Transportation is the latest in a series of reports from USGBC designed to provide a holistic snapshot of the green building movement in international markets. The report equips green building advocates with the insight and perspective to understand the use of the globally recognized LEED rating system and to make a strong case for sustainable building activity. View the full LEED in Motion: Transportation report at https://readymag.com/usgbc/transportation/.